Surely the pastel de nata is synonymous with Portugal, but you may also be interested in knowing that its populary is world-wide. 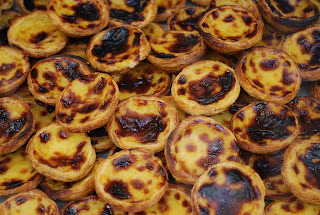 If anyone has been a great embassador of our little custardy cake, it's the 5 million Portuguese throughout the world. Myself personally, while growing up in Prince George, B.C., Canada, I certainly didn't have the pleasure of going down to a local Portuguese café like our Portuguese-Canadian friends residing in Toronto or Montreal who have their Little Portugal's. We in Prince George were fortunate enough, however, to have among our community, a baker from the Minho region who had worked at the Pasteis de Belem Factory in Belem for 10 years before having moved to Canada. Every Christmas and Easter he made a killing making and selling his pasteis de nata to the community and believe me, they were just as tasty as any you'd find here in Portugal. Ok now certainly we can look at this and think that it's just not right to be taking something that is so typically Portuguese and making it something that it is not. Well certainly the Portuguese are not too worried. 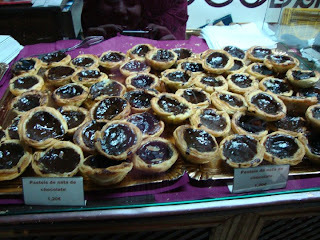 Just recently at this years Chocolate Festival in Obidos they were selling these tasty little morsels - that's right, chocolate pasteis de nata. So as we can see, in this globalised world we live in today, everything is everywhere and everything's up for grabs. One thing I could certainly grab right now...? Yeah that's right, you guessed it ... a pastel de nata; but I think I'll stick with something a little more traditional, as in a pastel that comes via Belem. Very nice article (as usual) João! where to buy them in prince george? Now, I haven't tried the chocolate nor the maple syrup versions... I love the traditional one too much to even try the new versions (and frankly, the sight of those new ones turn my stomach upside-down - one day, I hope, I'll be able to stomach it enough to be able to taste them)... 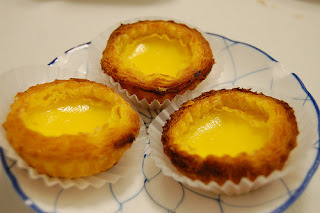 I'd love to make the traditional ones at home and, unfortunately, I can't find the proper individual molds to make them... and no, muffin/cupcake pan won't cut it lol... Do you know where, on the Montreal island, it would be possible to buy non-stick molds for pasteis de nata?